Natural anti-aging: is there such a thing? We don’t exactly know how long people have been looking for the fountain of youth. We can however observe that older people today seem to age slower, they get young hair cuts and wear trendy clothes. Seniors also seem to be less wrinkly today than they used to be. This could be a result of anti-aging products. But we also shouldn’t forget that nowadays, life is easier than it used to be. In order to successfully approach natural anti-aging, we have to consider several possibilities. Initially, nutrition has to be considered as a rejuventating entity. 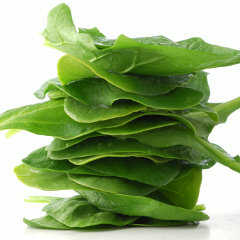 Food research promotes spinach as an anti-aging vegetable for instance. Vienna University discovered that spinach, i.e. natural plant materials can work against oxidative stress, which accompanies all age processes. Oxidative stress damages cells and therefore leads to skin aging. Spinach contains ingredients such as beta-carotene, B-vitamins, folic acid and lutein, which ensure protection against UV rays or inflammation-related redness. In general it is known that natural plant substances from our diet are more effective than synthetic ones. This is due to the bioactive substances in them which are not found in synthetic substances.This would certainly imply that we should eat more spinach and more fruit and vegetables overall. They are among the cheapest and most natural anti-aging formulas around. Those who stick to this are among the women who still have a flawless complexion when they are 40 and who learn complicated yoga asanas when they are 50. Amino acids are key nutrients when it comes to beauty. Eight essential amino acids guarantee our survival as they are among the most essential building blocks of life. A further group of amino acids, which carry out specific functions for the body. The right amino acid supplement can act as an internal system treatment, which particularly benefits the skin and hair. Creatine is particularly important for cell renewal and the metabolism of the skin. It can be synthesized in the body from the amino acids methionine, glycine and arginine. Glutamine keeps the acid-alkali balance regulated and promotes firm skin. Although the body can produce it, production decreases as we age. As a result, if these amino acids are not externally provided, skin becomes slacker. Other effects make carnitine, cysteine or the mineral zinc, for example, which are even more effective when vitamin C and B are taken at the same time. It’s no wonder scientists have often described particular amino acids as the ‘fountain of youth from within’. Firm, youthful skin can therefore be achieved through the right kind of nutrition, sport and supplements containing amino acids. Hormones: a fountain of youth? Many doctors believe the fountain of youth is pre-determined in the hormones. They occupy a key role in the aging process, because they break down and hormone levels drop as we age. Oestrogen, used among other things to keep the skin firm, ceases to do job properly after the menopause. Other hormone levels already decrease from the mid-twenties. In the USA, hormone injections are common practice, whereas people in the UK tend to be rather more sceptical. We try to think of doing sport as a rejuvenator, as it is able to encourage hormone production. Sport medicine specialists and nutritionalists always seem to have known that a nutritious diet is among the most effective hormonal stimulators. Free radicals can be neutralised with the correct dose of vitamins, enzymes, amino acids and minerals, which encourage cell metabolism and the production of certain hormones. Magnesium for instance can activate enzymes which help the body to produce the hormone DHEA. There is in fact no better or more natural way to support the fight against wrinkles than through a balanced, nutritious diet. Nevertheless, without drinking enough water, these ingredients will not be able to work effectively. The body requires at least 2 litres of tap or mineral water daily to be able to carry out its work in an optimal way. Skin elasticity and circulation in particular can be boosted in this way. Waste products can be disposed more effectively and find it easier to nutrients can reach the smallest of blood vessels. Fizzy drinks, well-being drinks, caffeinated energy drinks or coffee are no replacement for water.